Met 2 Reiki master/teachers today. One was earthy, the other fashionable; both beautiful. Both had long black hair. W, the earthy one, was dressed in black and tan, no make-up, some jewelry. L looked 10 years younger than W, was flawlessly groomed, wore stylish black and white clothes, perfume, and salient jewelry. We talked about Reiki, Reiki practice and pathways, volunteer opportunities, and their availability. "We work together," W said firmly. L nodded. "Are you friends? Relatives?" I asked, curious and confused. "Friends. We worked together for 16 years, and both got laid off a year ago. Haven't worked since. We're trying a new path. Reiki." I wasn't sure. I felt bewitched. "Yes," I said finally. "Welcome. Here's what you have to do..."
So I've been having this ethical dilemma about stones. Stones and crystals. It all started when someone told me she was going mining for stones. "We use dynamite! We blast and then go in and pick up the crystals!" Well, I felt that blast in my solar plexus. Gaia! Is that how we get stones? Today I asked several people. I was at a psychic fair. There were lots of stones. One person said, "Stones offer themselves to us." I remembered Angela telling me that if I find a stone, I must ask it if it wants to come home with me. On my way out of the fair, I stopped at one last booth. A tall, thin, woman was playing three singing bowls. I heard them while speaking with the wise man; a background to our thoughtful discussion. I noticed some small, brilliant crystals on display. The sign said, "Lemurian seed crystals." "What are those?" I wondered. I picked up a couple of them. They were small, pointed on one end, with various striations,inclusions, and degrees of clarity. $3. My price range. I got out my wallet and the woman stopped playing the bowls. She walked over to give me change and I asked about the sign. "What does that mean?" She launched into a lengthy intelligent explanation and I listened, at first with skepticism, and then with growing interest and acceptance. "Well crystals usually form on a matrix, but these were found spread out on sand. Scientists couldn't explain how they were formed. Some people got together to meditate, and decided they were encoded in Lemuria. See the little lines? We think they were coded in Lemuria.. . have you heard of Lemuria?" "Coded then, to be reunited now. And activated." While she spoke I found another that spoke to me. So I bought two. One is a milky blob that rises to a brilliant, clear point. The other has one side that is bubbly, otherwise a clear point. Lemurian seed crystals, hello again. I don't provide answers. I have lots of questions. Maybe too many. Reiki is a path. If you take a Reiki class you take the first step of your Reiki journey. I'll help you start your journey. Reiki will change your life. Just keep going back. Back to the mantra, back to the breath, back to the program. Not working for you? Check directions. Take a class. Do it with a friend. Weight Watchers works for me. I lost some weight 5 years ago, and told myself if I started to gain I'd go back. I gained 10# this winter, so went back. Yeah, those healthy seeds and nuts? Lots of calories, more than I need. That's why I gained. That and a change in work schedule that impacted my exercise routine. And snow-light winter, less shoveling. I gained. Back to the program. Week 1. Weighed in: eek. Tried hard, walked far, no chocolate. Week 2: lost 4.6 pounds. Yay! Bought a new dress. Still no chocolate, but what if I starve? Ate lots of fruits & vegies. Stressful week. Ate more fruits & vegies. Did some weeding (see dandelions) but no long walks. Week 3. Gained a pound. Oh no! It's the tempeh, right? Too much sodium? All water weight. What evs. The important bits: get back on program and be accountable. Note to self: be pos. It feels good to eat right and lose. I have more energy. Kale is good. Ginger too, and fresh spring water. Just get back. Didn't one of those Beatles ... PM, Get Back. Yes. I could eat them. "That one's a meal!" Wini exclaimed, as we ambled around Paris Hill and spotted a large spreading specimen. One can eat dandelion greens, can them for later, or make dandelion wine. I'm profligate. I waste them: toss them on the compost pile. I bought a lovely padded ergonomic tool and spent last weekend digging armloads out of my lawn. So easy to find: bright yellow flowers and wide toothy leaves. Satisfied with my effort, I lotioned my bruised hands. Then we had a nor'easter wind and rain storm and new ones blossomed. Today I pried stubborn roots out of the cold muck that is my backyard. Tonight I'll scrub my nails. Tomorrow I'll go to work with farmer nails again, bit of dirt here, little more there. Meanwhile I'm remembering WS Wells of Wilton ME, who grew and canned dandelions. Check it out. Or Belle of Maine on FaceBook. Felt the familiar throbbing in my hands as I placed them on Bertie's head. I was sharing Reiki with practitioners who I admire & respect, at our monthly meeting. We talked for the first hour and a half. 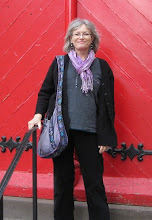 I so enjoy hearing the Reiki thoughts and experiences of others: intelligent discussion of one of my favorite topics. The teacher is the student. Bertie was tearful when we went round with introductions. She's experienced a lot of losses recently. She needed some Reiki love and attention. She got a triple dose: a short session with three practitioners. We had a guest speaker. He was erudite, educated, and engaging. He led us in a beautiful heart meditation. B, the massage therapist and Reiki practitioner fixed the stabbing pain in my neck. N taught us a breathing/sound exercise to wake the pineal gland. Or maybe something else, so sorry, but B was doing trigger release just then and it was momentarily excruciatingly painful. But effective. 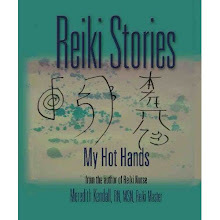 I love Reiki shares and will so miss it in May. Just can't seem to schedule it. Sometimes I'm too busy. Does that happen to you? It's good busy, but still. So today was good. Spent the day with my super fab group of nursing students. Eight of them. Yeah, they're amazing. Educated, experienced, kind, capable, and committed. Way cool. Oh, and over half of them are Aquari. Aquariuses? Aquarians? (one of those). Got up early. Ate oatmeal w berries. Guided 24 nursing students on a continuum of care. Started with a lecture with a palliative care nurse practitioner. Then a tour of an outpatient wholistic cancer center. Then a hospice house. Then late lunch at the local. I love being a teacher and love my students. They are superb human beings. Spent time at home with dog. Weighed in @ WW. Lost 4.6 pounds, yay me. Bought a dress for my nephew's wedding. A summer wedding in Tulsa. Hot? Yeah, prob. Got a wash & wear, missoni-type zigzag print in black/white/gray in a satisfactory size. Have the shoes, good to go. Then a local organizing meeting for a big fall fundraiser. Lots of people, pizza ( I refrained! ), laughs, and a touching video clip. Home again. Sat on the deck, 40-some degrees so a little cold, dusk. Fluff rooted around the grass and gardens. The leafus giganticus, spinach, kale, and peas are coming along nicely. Pansies and daffs too. Gird self (wild ride, etc); she won't like it. Don't call her. Go get her. Pick her up and place her in the shower. Rinse with warm water. Select organic shampoo. Or dog shampoo if you are so organized and prepared for such. Lather and massage, especially most needed areas. You know what I mean. Release to wild. Or backyard. She won't shake in shower, of course, but will shake on expensive hickory hardwood floor even though you're holding the door open. Go out! Mop floor. She will shake again on deck (fine) and then will roll on grass vigorously, as though to dispense and cleanse of stinky organic shampoo. Hey, that was expensive! She doesn't care. She looks like milkweed fluff when dry, and a chihuahua when wet. Her hair kinks and drips. She doesn't believe in being wet, and protests. She is not a water dog. She's a shepherd. She wants her flock to be together and safe: protected from wolves and thieves. It was stressful and exhausting. Time to snore on her couch. Wait, is that wrong? I have a chair and she has a couch. hmm. So sorry to miss your party, gathering, class, or workshop. I'm such a hermit. I need solitude and nature to recharge. When I see you I smile, extend warmth, and talk ( I hope. I do, right?). I mean it and it's easy, as long as I have the requisite number of hours of above (nature & solitude). I need birdsong, breeze, and botany. I require water, waves, and wind. Find solace in contemplation, cultivation, and canines. I also like to read, research, and write. So I sincerely apologize to my extroverted friends who require companionship, constancy, and conversation. So sorry. Just registered my car online. I don't have to take time off from work, drive to City Hall, find a parking spot, and remember to bring all the correct items. I mean, City Hall is nice inside, all marble floors and columns. But really, this is so much easier. Not a lost art. Not gone. Struggling, yes. So many people are way too busy, locked onto edevices, and rushing around from work to family, dear friends, and pets. But there are volunteers out there. They strive to improve your life and their own. They care. I had the honor and the pleasure of addressing a crowd of volunteers this evening. And if my dog didn't need me desperately ("Let me out! Feed me! Play with me!") I would have stayed to thank them, hug them, and share a delicious meal with this wonderful group of caregivers. Who volunteers anymore? Do you? Do I? (Well, yeah, I do. Wish I could do more. I volunteer at a cancer center and an assisted living facility.) Just saying.... if you haven't tried it, well, maybe you'd like it. My volunteer relationships and activities are some of the most rewarding parts of my life. Maybe you think you have no special talents, no time. You know what? Just you is enough. Can you sew? Talk? Hold a hand? Hammer? Write someone's story? Teach the thing you know best? You can volunteer. Try it; it will make your heart happy. Scrub sweet potatoes. Slice into long strips. Lay on baking sheet. Drizzle with olive oil, sea salt, and favorite herbs. Bake 45 min at 450 degrees, stirring once. Good with spicy ketchup. Another recipe. Buy potatoes. Scrub in cold water. Slice as thin as possible. Pour 1 tablespoon olive oil in casserole dish, layer potato slices with whole wheat flour. OK, now you need a real cookbook, but make a white sauce with flour, milk, and butter. Dump white sauce over potato layers. Optional: parsely and garlic. Bake 45 min at 350 degrees, covered. Yum. Happy Easter. Recipe. Buy dozen free range organic eggs. Saucepan, 1/2 full of water. Set on stove, burner on high. Put groceries away. Feed dog. Dump soap & laundry into machine. Check water. It's boiling! With large spoon, gently place egg into water. Place 11 more. Wait for water to boil again. Turn burner to low or off. Let cook 12 minutes. Time to let dog out, put clean dishes into cupboards, take a shower. Eggs done. Rinse in cold water. Refrigerate. Lunch for week, alone or with salad. Just sounds like screaming to me. I've tried. Some people like it. There are stories, classical music. I like those parts. But not the screaming and shrieking. Sorry! Call me a rube, a redneck, rustic. I'd rather listen to folk, rap, rock, or even country. Water, birds, silence. Best sound? The wind. The tire guy told me to come back in 2-3 days to get the lug nuts checked. Come on. It was hard enough to get in there to get the tires switched over: snow to regular. Of course, flurries are now predicted for tomorrow. So. Back to topic. Lug nuts. To check or not. Any tire mavens out there? a big problem in 2012. Was supposed to go back to WW today with a co-worker. Today didn't work out. Maybe next week. Meanwhile am trying LoseIt app. She wags her tail when I get home from work. She makes me go for walks and hikes. She's sweet. She's also flatulent. She eats gross stuff, and sometimes she wants to go out at 4 am. She acts as though other dogs are wolves from whom she must protect me. She follows me from room to room. If food drops on the floor she will clean it up. Happy Passover! Hide that afikomen. Best Passover ever? Sun City West, AZ, 2003. We were together. We swam outside in the Arizona sunshine. We went to sacred sites in Sedona, and it snowed at the Grand Canyon. Happy Spring! Daffodils, warm sun, and gardens. Ice disappears and green jumps out. Happy Easter! Nurses plan for exacerbations of congestive heart failure because people ingest excessive amounts of sodium in Easter ham. Church, Easter dresses, shiny shoes, and hats. Family, chocolate eggs, colored eggs, and egg salad sandwiches. Best Easter? When we dyed eggs with cousins and tossed the dye onto the snow, a la Jackson Pollack. Big family dinners with hot rolls, love, and laughter. Is so important in nursing. To be a great nurse you must be able to communicate well, assist others, and express compassion. We work in teams. As teachers, we must teach teamwork. So I let the students take turns being charge nurse and CNA for the team. See how it feels. See what it means. What do you do, think, and plan? How do you relate to others? Can't believe how many skills required to be a great nurse. And I want all my students to be great nurses. Selfishly, as I age... I want to look up from that stretcher or hospital bed and see a great nurse. My son explained his job to me. "I'm in Receiving a lot. I have to check the titanium, it's expensive, you know. We measure it, with a computer. If it's off by a thousandth of an inch then I have to contact the supplier." "Does your office have a window?" I asked. Thinking of my g-grandmother, Almurtie Hastings, who died in the 1918 influenza epidemic, leaving behind 8 (?) children, my grandmother the oldest.